Sometimes, owners sue their condo or homeowners association in small claims court. And sometimes, they win, and there is a judgment to be satisfied. The association pays the amount of the judgment and then wants a receipt showing that the judgment is not owed any longer. They do not know what to do when a judgment or a portion of a judgment has been satisfied. How do you get the homeowner creditor, flush with the fruits of their lawsuit, to provide their association with an “acknowledgment of satisfaction of judgment” (the form that should be completed and filed with the court to show that the judgment is no longer owed)? Board members and managers often ask why they would bother taking this step since the judgment is satisfied. 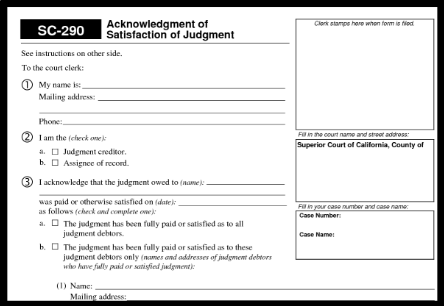 As soon as a judgment or a portion of a judgment has been paid and therefore satisfied, the association should insist – and the homeowner or their attorney should see to it – that an acknowledgment of satisfaction of judgment or an acknowledgment of partial satisfaction of judgment is prepared, filed with the clerk of the court where the judgment was obtained, and recorded with the county recorder’s office in each county in which an abstract of judgment has been recorded. If this form is not filed with the court, technically, the debt is listed with the court as still owed, and an unscrupulous judgment creditor homeowner could take steps to collect more than they are entitled to from, for example, the association’s bank account. It is also extremely important to record the acknowledgment with the county recorder if an abstract of judgment has been recorded. Once recorded, an abstract acts as a lien on any real property owned by the judgment debtor/association. Should the association end up foreclosing on a unit and then try to sell the property, the abstract will cloud title, and the escrow company will seek a pay off demand from the judgment creditor. By recording an acknowledgment, the judgment debtor association lets the world know that the debt has been satisfied, and the judgment debtor can proceed with any real property transaction. The association should make sure to get a notarized acknowledgment, as the county recorder requires documents that will be recorded to be notarized. If you don’t get a properly notarized document, the association will then be asking the attorney for the owner/judgment creditor, or the owner directly, for another acknowledgment of satisfaction that is notarized. And often, they are not inclined to cooperate, which could make it difficult for the association to close the matter. What happens (and it does happen, especially where there are no attorneys involved) if the owner/judgment creditor refuses to cooperate and provide the requested acknowledgment? Code of Civil Procedure Section 724.030 puts an affirmative obligation on the judgment creditor to file with the court an acknowledgment, which is served on the judgment debtor either personally or by mail. This section does not apply where the judgment is satisfied in full pursuant to a writ of execution, for example on the association’s bank account. Section 724.020 authorizes the court clerk to enter satisfaction of judgment in the register of action when a writ is returned to court satisfied for the full amount of the judgment. If the association is not able to get voluntary compliance with a request for acknowledgment of satisfaction of judgment, then Section 724.050 provides a statutory process for obtaining it. Code of Civil Procedure Section 724.050 provides that the association as a judgment debtor may serve personally or by mail on the homeowner/judgment creditor a demand in writing that the judgment creditor do one or both of the following: (1) file an acknowledgment of satisfaction of judgment with the court; (2) execute, acknowledge and deliver an acknowledgment of satisfaction of judgment to the person who made the demand. The Code requires that the demand include certain specified language. Compliance by the homeowner/judgment creditor with the demand must be no later than 15 days after actual receipt of the demand. If there is no compliance with the demand, the association making the demand may apply to the court on noticed motion for an order requiring compliance. The motion requires 15 court days notice pursuant to Section 1005. The notice of motion shall be served on the judgment creditor personally or by mail. If the court determines that the judgment has been satisfied and that the homeowner/judgment creditor has not complied with the demand, the court shall either (1) order the homeowner to comply with the demand or (2) order the clerk of the court to enter a satisfaction of the judgment (Section 724.050 2(d)). The same procedure exists for a partial satisfaction of judgment as contained in Section 724.110. The Code also provides that for not complying, the homeowner forfeits $100, which is not enough to cover the association for having to hire legal counsel to make the motion. A judgment debtor homeowner association can recover the attorney fees incurred in filing a motion to seek an acknowledgment of satisfaction of judgment pursuant to Section 724.080, but this would not apply if the case was heard in small claims court. It is a good idea for the reasons stated to file and/or record an acknowledgment of satisfaction of judgment, whether partial or full, upon payment of the judgment. And when in doubt, consult with experienced legal counsel.